Ranger is another product of a happy union among a knowledgeable client, a receptive design office, and an expert builder. Craig Stephens, a former designer at John Alden, wanted to cross oceans with maximum economy and comfort, ticking off 200 mile days in virtually any wind condition or direction. He had developed a concept for a minimum resistance and maximum range cruiser and commisioned us to bring it to fruition. A true motorsailer, Ranger is normally operated with the engine running and the compact sailing rig providing both an assist to propulsion as well as effective roll stabilization. The long NACA section keel provides lift and has room to fit the main engine and several tanks, keeping the amount of ballast to a minimum. The propulsion system is devised for maximum fuel efficiency with a commercially rated John Deere 4054TFM diesel coupled to a 3.71:1 reduction gear. Ranger can cruise at 9 knots while sipping a mere 3.25 gallons of fuel per hour. The interior layout is comfortable for the owner and his wife plus an additional couple. Special attention was paid to ensure that there is adequate space for every item that long term live-aboards will bring along. 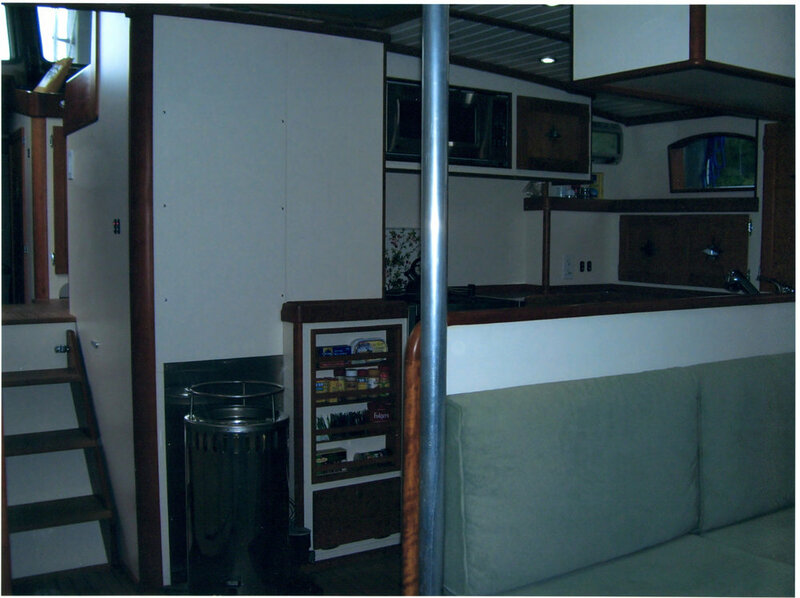 The galley is both spacious at rest and secure at sea, with direct access to the large dining/entertainment area aft. Ranger was expertly built of aluminum at Lyman Morse Boatbuilding in Thomaston, Maine. The hull and deck are unpainted for low maintenance, a finish that compliments the rugged good looks of the design. The Stephens family has cruised extensively up and down the United States east coast and to the Bahamas. A trip to Europe is in the offing, where Ranger will show more of her versatility - making the Atlantic crossing and then, with the tabernacle-stepped mast lowered, exploring the famous network of European inland canals.